This installment of the Player Paraphernalia-series clocks in at 8 pages, 1 page front cover, 1 page SRD, 1 page advertisement, leaving us with 5 pages of content, so let’s take a look! The opportunist base class receives d6 HD (which usually are reserved for casters), 8+Int skills per level, proficiency with simple one-handed and light weapons, martial one-handed and light weapons, bows, light armros, bucklers, light shields and may either choose additional Int-mod proficiencies in martial weapons or +1 exotic weapon proficiency for a weapon that has the disarm, reach or trip attribute. The class gets 3/4 BAB-progression and has good Ref-saves. The opportunist receives a bonus to armor cutting, dirty trick, disarm, feint, reposition, steal and trip equal to his Int-mod and also gets Combat Expertise as a bonus feat at 1st level, though, regardless of proficiency, he takes the armor check penalty as penalty to these maneuvers when wearing medium or heavy armor. Wait, what? Yes, there would be a new combat maneuver, armor cutting. This requires the use of either a slashing manufactured or natural weapon. If your CMB works, you reduce the armor of your opponent’s Max Dex-bonus by 1 and increase armor check penalty by 1 as well. Medium weapon grants +1, heavy armor +3 and magical armor also provides its enhancement bonus to CMD versus this maneuver – at least I think it does. RAW, the text could be read as “instead”, but that makes no sense, so in dubio pro reo – still, a minor nitpick. Multiple uses stack…but this still is one of the weakest combat maneuvers and against most targets, not a particularly good strategy. In an interesting twist, 1 point is replenished each time the opportunist successfully performs a combat maneuver against an adversary with HD equal to or greater than the character’s class level – meaning this can’t be kitten’d, has a solid frame and is pretty much abuse-proof, thankfully also capping at the maximum. 7th level provides uncanny dodgem 11th improved uncanny dodge – but the truly interesting component, apart from the aforementioned pool, would be the 5th level opportunity gained – these would be the talents of the class, though only an additional one is gained every 4 levels thereafter. Minor SPs, double aid another, using the pool to slightly enhance AC and point-based evasion (sans need to expend points to activate) – all okay, but not that interesting. Extending feint-benefits to allies would be neat and limited access rogue talents also work. At 15th level, the opportunist can combine two combat maneuvers from his specialties in one full-round action – both at -4…which is overly punitive. For one, some maneuvers can be executed already instead of an attack. Secondly, the bad BAB, in spite of the bonus of the class, means the character will not be that good in maneuvers to begin with…and then, potentially still provoking AoOs if you don’t have both improved-feats…well…that’s pretty much a non-ability, though the penalty decreases at 19th and 20th level, with the capstone allowing for three maneuvers to be combined. The pdf closes with 5 new feats – crit-based armor cutting, +1 opportunity, Improved and Greater Armor Cutting and an expansion of Combat Reflexes…that adds Wis-mod AoOs, replacing the Dex-based ones of Combat Reflexes…while still needing it as a prereq? Very odd and a bad idea – If Wis-mod is so much better for a character, then the dead Combat Reflexes-feat is a bad investment. If not…then, why take this feat in the first place? Editing and formatting are very good – I noticed no glaring glitches of a formal variety and rules-language also is concise for the most part. Layout adheres to a 2-column full-color standard and the pdf sport a piece of solid stock art. The pdf comes fully bookmarked for your convenience and with the good kind of hand-crafted, useful hyperlinks. John Buckley’s opportunist tries to be basically a rogue that replaces sneak attack with combat maneuvers and tricky fighting and the associated bonus feats – which is a neat concept. Design-decision-wise, the class has some cool ideas – the opportunity-pool-recharge is interesting and the idea of opportunities is as well. However, the class ends up being exceedingly weak. As in even weaker than the vanilla rogue. The bad BAB screws over the maneuver-prowess of the class, its very life-blood. At low levels, the attribute-bonus does offset that, but in the middle and high levels, these guys, alas, are no longer competitive – a fact exacerbated by the exceedingly weak high-level abilities – which feel to me like they should have been the center of the class, not an afterthought: Multiple maneuvers at once, growing in potency and combination options? That sounds pretty much like a great class waiting to happen. Instead, they are pushed to levels where they are neither competitive, nor do they matter much. The minor hiccups that can be found here unfortunately do not help the pdf either. The new combat maneuver is a good idea…but not one I can see any character using in its current form…ever. There is no scaling reward (more damage on sunder, higher chance of broken weapon; higher roll on reposition, more reposition…) and the reward ratio, even at level one, alas, is pitiful. Where is the entangle? Where is the “armor falls to the ground?” Granted, the improved/greater feats allow for some neat combos here, but enough to warrant the weak base maneuver? The opportunist has some awesome ideas and is, craftsmanship-wise, solid, if not perfect. But, oh boy does it need a power-upgrade bad. As written, I’d consider this a slightly better NPC-class or one that mainly works in VERY low magic, low power games where escalating magical defenses do not make the CMB/CMD-math of the class completely get left by the wayside. Still, while pretty weak, the class itself does kind of work (notable one exception in the pool-ability) – though even within the class, balance is odd: The opportunities range from ludicrously weak to nice and could use some internal balancing as well. My final verdict will clock in at 2.5 stars, rounded up to 3 for the nice ideas that can be found herein. 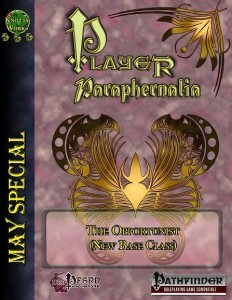 You can get this inexpensive class here on OBS and here on d20pfsrd.com’s shop.